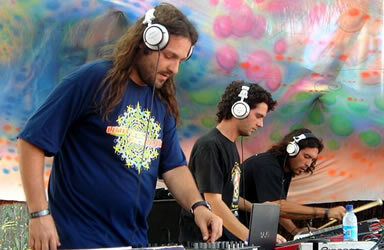 The First Stone was born out of the joining efforts of producer Gustavo Manfroni (aka Burn in Noise), DJ Swarup (organizer from Universo Paralello Festival), and the DJ and percussionist Zumbi. The inspiration behind The First Stone lies in the lights and colours of the hippie movement from the late 60s and early 70s and primitive elements of Brazilian culture. Its vigorous and colorful sounds have made The First Stone one of the leading projects in the present Brazilian trance scene and their live presentations are marked by intense response from the dancefloor.